The equipment is housed in more than 200 Lowell Manufacturing LSGR-4427 seismic certified gangable cable and termination racks.The California Health Care Facility near Stockton, CA, is a 1.2-million-square-foot facility being constructed by the state’s Department of Corrections and Rehabilitation that will provide intermediate medical and mental health care and housing for up to 1,722 patient-inmates. On schedule for completion in July 2013 with full occupation and operation by year’s end, CHCF-Stockton is a $900 million project that state officials estimate could potentially generate more than $300 million in payroll annually and add in excess of $1 billion to the region’s economy, a boost that is much needed in an area that has been hit especially hard by the recession. “This project is a direct result of the Federal Court ruling mandating an improvement in California’s prison healthcare system by December 2013,” explained Mike Delaplane, director of engineering for MCS at its office in San Antonio, TX. MCS, a security electronics systems integrator that specializes in the planning, design, fabrication, installation, and maintaining service of facility systems in city, county, state, and federal correctional institutions, provided CHCF-Stockton’s security electronics systems. “As a systems integrator we provided IP video surveillance and recording, intercom, access control, personal duress and security electronics systems,” said Delaplane. MCS’s security systems address door control, card access, emergency notifications by staff members, CCTV, and audio. The equipment is housed in more than 200 Lowell Manufacturing LSGR-4427 seismic-certified gangable cable and termination racks. Lowell’s LSGR Series racks have been certified as OSHPD Code Compliant and are designed to withstand seismic activity, a key criterion for highsecurity applications in earthquakeprone California. The racks are seismically qualified up to 1,200 pounds, depending upon the model, building code, or standard required. Being suitably compliant, the racks meet the stringent guidelines of California’s Office of Statewide Planning and Development. “The fact that these Lowell racks are already pre-approved by OSHPD, and that Lowell provides complete documentation that we can turn over to the engineer of record, means that we don’t have to expend the resources to have them evaluated by a professional engineer to assure that they meet the seismic standards of the state of California. We know right out of the gate that they will work exactly as we need them to,” commented Delaplane. 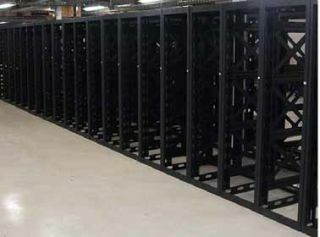 The seismic tolerance of the Lowell LSGR Series is not the only reason that MCS has selected the racks time and again for its projects, he added; quality and consistency of workmanship are also important criteria, as are features such as the optional fan panels, which offer active thermal management. The networked electronics systems supplied and installed by MCS include Harding Instruments IP audio intercom, Vicon IP CCTV surveillance and recording system, Omron PLC (programmable logic control), Software House access control, Actall Corporation personal duress (wireless personnel location), Elo touch screens, and Wonderware touch panel GU I software. The central administration building houses 20 ganged Lowell racks incorporating the electronics systems in an equipment room, while equipment for each of the surrounding housing units is installed in a standardized configuration across six ganged Lowell racks. “That’s our economy right there,” noted Delaplane.